Description: ”K.C. Barker” Engine Company in front of the fire station building on Orchard Street. 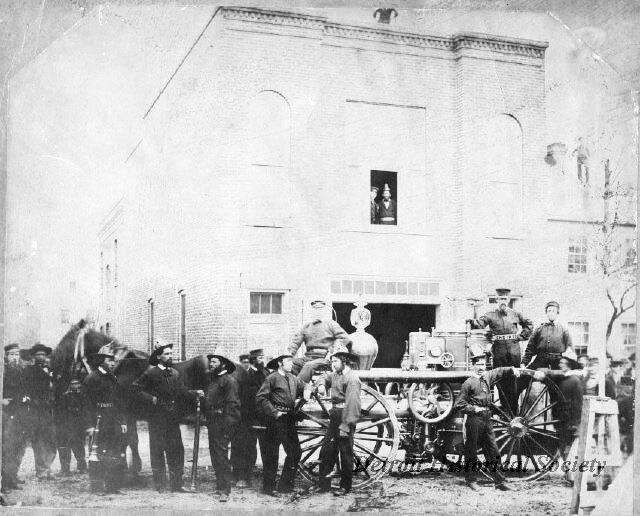 The horse-drawn steam fire engine is parked on the street in front of the 2-story brick fire station. Five firemen (wearing helmets) are standing near the horse and wheel at the front of the steam engine, one fireman is seated in the driver’s seat, and four firemen are standing adjacent to the rear wheel of the fire engine. The fireman who is nearest to the horse’s head is wearing a belt with the lettering, ”Foreman.” The fireman who is standing above the rear wheel axle is wearing a belt with the lettering, ”Engineer.” All of the other firemen are wearing belts which show the name ”K. C. Barker.” Circa 1878. Shown in front of Engine 4-1.